Description: L. clavigera may grow to 20mm in length. 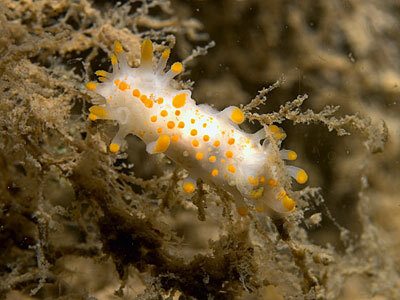 It is white with yellow-orange tipped processes around its body. The processes at the front have rough surfaces and are held horizontally. Those at the sides of the body are smooth and are normally curved upwards over the dorsum. There are slightly raised orange spots on the animal's back. The rhinophores are lamellate and they are also tipped with yellow pigment. 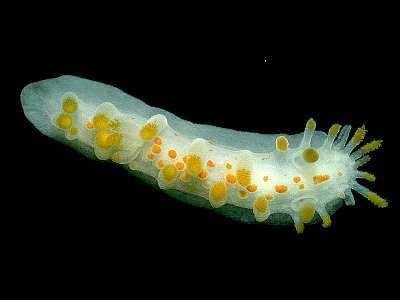 Habitat: A common species which feeds preferentially on the bryozoan Electra pilosa usually on red algae in the shallow sublittoral. Individuals may also be found feeding on other bryozoa beneath rocks in the intertidal and on bryozoan encrusted stones in tide races. Distribution: This species is distributed all around the British Isles and from Norway to the Mediterranean and along the North African coast. Long, orange tipped processes all around the edge of the mantle. Three small gills and orange tubercles on the back. Picton, B.E. & Morrow, C.C. (2016). 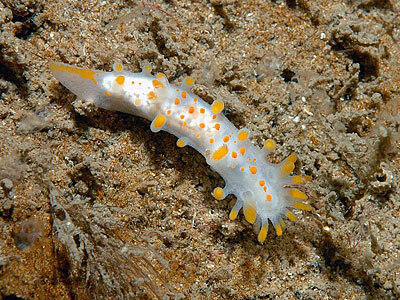 Limacia clavigera (O F Müller, 1776). [In] Encyclopedia of Marine Life of Britain and Ireland.